A pair of bangles - one textured and one plain, made from 2mm silver. 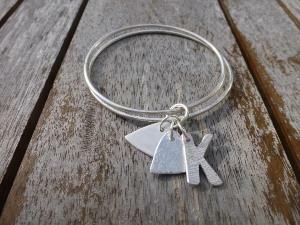 The 3 charms can be a mixture of hearts and initials please specify when making the order, two charms are textured and one is plain and polished. The charms each measure approximately 1.5cms x 2cms. This item is hallmarked by the London Assay Office and includes my sponsors mark.